The protected tide pools of the Olympic National Park provide visitors with the chance to view a huge diversity of marine life. Some consider the tide pools of Washington among the best in the country. Where can I find and enjoy exploring tide pools? About 12 miles from the town of La Push, Rialto Beach attracts marine biology professors and students from far and wide who are fascinated with the area’s tide pools. Expect to find unique orange and purple sea stars, whelks, nudibranches, chitons, limpets, and so much more. Getting Here: From Port Angeles, head west past Forks and follow the signs for Rialto Beach. Park in the Rialto Beach parking lot and walk about 30 minutes to the other side of the famous Hole-in-the Wall formation for your best bet. Like neighboring Rialto Beach, there’s so much interesting sea life in the fascinating tide pools at La Push, which boasts a picturesque rugged coastline with formations you simply must photograph. 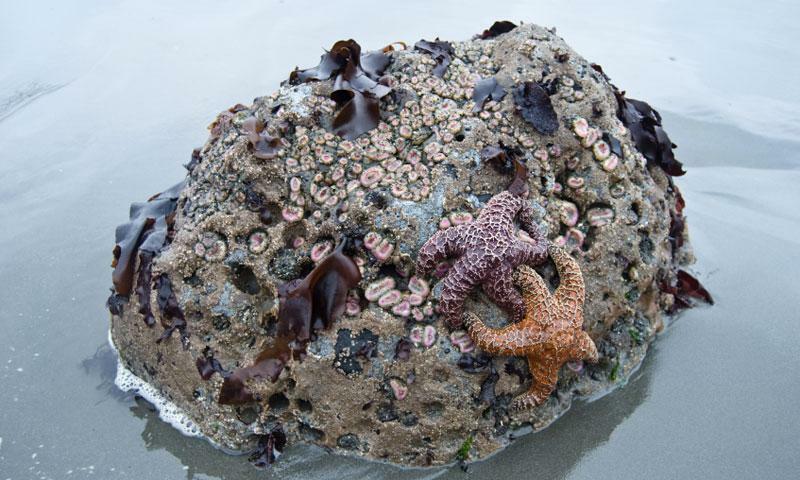 The tide pools and the rocks are teeming with anemones, stars, urchins, mussels, hermit crabs, and more. Getting Here: From Port Angeles, take Highway 101 west about 55 miles to La Push Road. Turn right on La Push Road (WA-110) to right on Adler and then left on Church. The inter-tidal zone here is considered spectacular by those who love to explore Washington tidal pools, and the region is easy to access from US 101. Sea stars are plentiful and the rocks are often covered with all sorts of barnacles including gooseneck and acorn. Look for giant green anemones, too. Getting Here: Travel an additional 45 miles south on Highway 101 from La Push and look for signs for Beach 4 near the Kalaloch Resort.